Colossal Cave Adventure running on a PDP-11/34 displayed on the minicomputer’s VT100 serial console. The Adventure 2.5 final version released in 1995 has never been packaged for modern operating systems. It went nearly extinct. Thankfully, the open source advocate Eric Steven Raymond has ported this classic game to modern operating systems with the permission from original authors after several years. He open sourced this classic game and hosted the source code in GitLab with a new name “open-adventure”. The main objective of this game is to find a cave rumored to be filled with a lot of treasure and gold and get out of it alive. The player earns points as he moves around the imaginary cave. The total number of points is 430. This game is mainly inspired by the extensive knowledge of cave exploration of the original author Will Crowther. He had been actively exploring in caves, particularly Mammoth Cave in Kentucky. Since the game’s cave structured loosely around the Mammoth Cave, you may notice many similarities between the locations in the game and those in Mammoth Cave. Open-Adventure has been packaged for Arch based systems and is available in AUR. So, we can install it using any AUR helpers in Arch Linux and its variants such as Antergos, and Manjaro Linux. On other Linux distros, you might need to compile and install it from the source as described below. There is also an Android version of this game available in Google Play store. You will see a welcome screen. Type “y” if you want instructions or type “n” to get into the adventurous trip. The game begins in-front of a small brick building. The player needs to direct the character with simple one or two word commands in simple English. To move your character, just type commands like in, out, enter, exit, building, forest, east, west, north, south, up, or down. You can also use one-word letters to specify the direction. Here are some one letters to direct the character to move: N, S, E, W, NW, SE, etc. For example, if you type “south” or simply “s” the character will go south side of the present location. Please note that the character will understand only the first five characters. So when you have to type some long words, such as northeast, just use NE (small or caps). To specify southeast use SE. To pick up an item, type pick. To exit from a place, type exit. To go inside the building or any place, type in. To exit from any place, type exit and so on. It also warns you if there are any danger along the way. 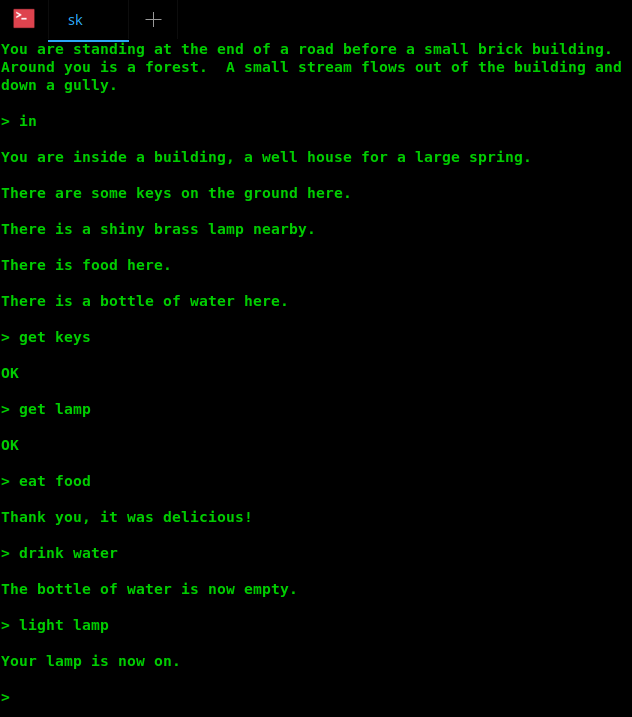 Also you can interact with two-word commands like “eat food”, “drink water”, “get lamp”, “light lamp”, “kill snake” etc. You can display the help section at any time by simply typing “help”. I spent my entire afternoon to see what is in this game. Oh dear, it was super fun, exciting, thrill and adventurous experience! I went into many levels and explored many locations along the way. I even got gold and was attacked by a snake and a dwarf once. I must admit that this game is really addictive and best time killer. If you left the cave safely with treasure, you win and you will get full credit to the treasure. You will also get partial credit just for locating the treasure. To end your adventure early, type “quit”. To suspend your adventure, type “suspend” (or “pause” or “save”). You can resume the adventure later. To see how well you’re doing, type “score”. Please remember that you will lose points for getting killed, or for quitting. I played that back in the early 80’s on a Commodore PET. I only ever got 299/300, even after a retry or two, and never did find out how to get that last 1 point. The latest version has 430 points in total. Give it a try. This version has some improvements with updated features. I recall that I wrote (converted) the game into a data-base project. Using old dBase-II, it worked, and I could modify the caves, and tunnels, and creatures who met me. But university work pulled me away to something else. Now, I wonder if this game concept could be implemented in a LibreOffice Spread-Sheet , making use of the embeded logic (macro) algorithms. I see that the lack of ‘relational variable names’ would be a handicap, but I still like the idea of using a universally available programming language (Spread-Sheet logic) to bring this easy game to the masses of Linux users. Well, dreams often spark a good project, even for us old geeky geezers !